IH 110 and U.S. 54 (Patriot Freeway) parallel one another in a dual freeway configuration before parting ways for Juarez, Mexico and Loop 375 respectively. Photo taken by Jake Bear and Kevin Trinkle (08/07/10). Interstate 110 currently connects Interstate 10 and U.S. 54 (Patriot Freeway) in El Paso with the Bridge of the Americas Port of Entry into Ciudad Juarez, Mexico. The short freeway also provides local access to U.S. 62 (Paisano Drive) and Chamizal National Memorial. IH 110 southbound travels independent of U.S. 54 on flyover ramps, and the same northbound with the exception of the ramp to IH 10 west. The U.S. 54 Patriot Freeway leading north from Interstate 10 is not a part of the Interstate highway system. Prior to 2010, the IH 110 designation was unmarked. Signs previously acknowledged only Juarez, Mexico from U.S. 54 (Patriot Freeway) southbound, and I-10, U.S. 54 and U.S. 180 from the port of entry exit northbound. 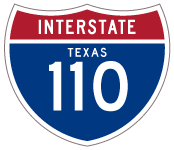 IH 110 is one of two three-digit Interstate highways that end at the international border. The other is Interstate 190 at Niagara Falls, New York. Currently under study, the I-10 Connect Project includes a redesign of the IH 110 spur to the Bridge of the Americas Port of Entry, and improved connectivity between IH 10 and SL 375 (Cesar E. Chavez Border Highway). The project goals address traffic congestion at the border crossing, and the use of local roads by commercial trucks to connect from I-10 to Loop 375. 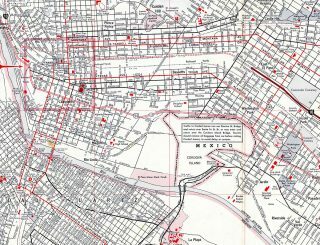 The future corridor of Interstate 110 through El Paso in 1966. Interstate 110 travels through the Chamizal National Memorial. Located on both sides of the International border, the park was created after a boundary dispute between the United States and Mexico. The disputed land arose when the Rio Grande shifted course in 1864. Establishment of the memorial in 1964 settled the issue. 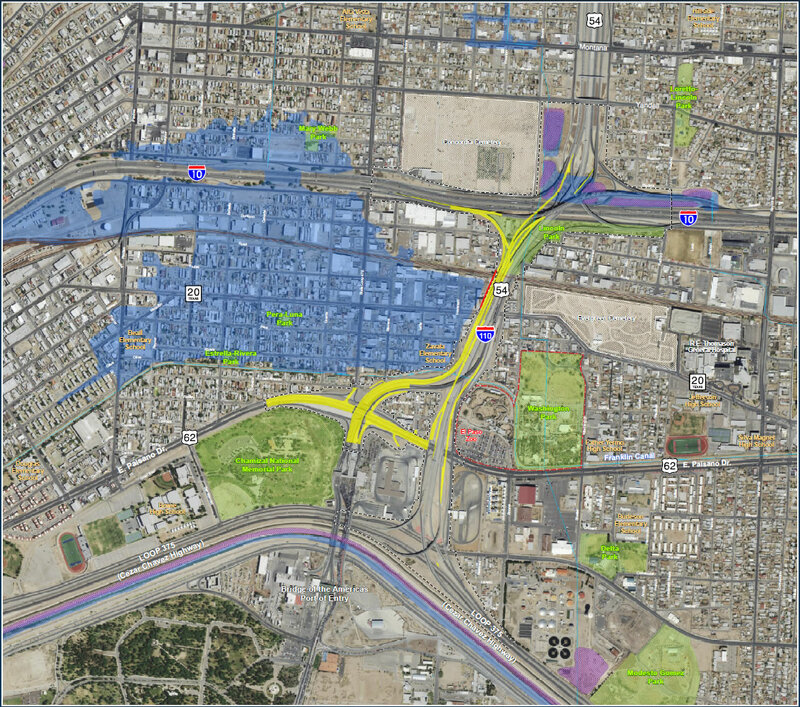 The Connect I-10 Study Area in El Paso. The Texas Bureau of Public Roads approved the designation of IH 110 with a certified mileage of 0.891 miles on March 28, 1967. AASHTO approved the addition to the Interstate system on June 30, 1970. Completion of the freeway occurred in 1973. Interstate 110 runs along side U.S. 54 in a dual freeway configuration. The mainline separates into a slip ramp for U.S. 54 north to IH 10 west and a flyover directly onto IH 10 east. Photo taken 04/25/17. IH 110 shifts eastward through a wye interchange to merge along the right-hand side of U.S. 54 (Patriot Freeway) north leading to IH 10. Photo taken 01/14/06. These button copy signs formerly directed traffic at the ramp split (then Exit 1A) from Interstate 110 north. They were replaced by 2005. Photo taken by Jeff Royston (12/00). The connection from IH 110 north to IH 10 west requires motorists to briefly merge onto U.S. 54 (Patriot Freeway) eastbound. Photo taken 01/14/06. A distributor roadway and loop ramp (Exit 21B / old Exit 1C) for IH 10 & U.S. 180 west departs from U.S. 54 east a short distance after the IH 110 end. Photo taken 01/14/06. Interstate 10 angles northeast from Downtown El Paso to Piedra Street and an easterly turn to a split diamond interchange (Exit 22A) with Loop 478 (Copia Street). Exit 22B quickly follows for IH 110 south and U.S. 54 (Patriot Freeway) east. Photo taken 04/25/17. Two lanes separate from IH 10 east for a lengthy off-ramp (Exit 22B) to U.S. 54 (Patriot Freeway) east and Interstate 110 south. Signs reference IH 110 south as simply “Juarez Mexico”. Photo taken 04/25/17. A two-lane flyover shuttles motorists onto U.S. 54 (Patriot Freeway) east to Fort Bliss while a single lane ramp turns southward to IH 110 for U.S. 62 (Paisano Drive) at Chamizal National Memorial. There is no access to U.S. 54 west to Loop 375, but one is proposed as part of the I-10 Connect project. Photo taken 04/25/17. This sign bridge directed traffic to both Copia Street and the forthcoming flyovers for U.S. 54 (Patriot Freeway) and IH 110 south. It was removed by 2007. Photo taken 01/14/06. Former button copy overhead posted along IH 10 east at the Raynor Street underpass for U.S. 54 and hidden IH 110. U.S. 54 originates 1.2 miles south of here at the junction with Loop 375. It follows the Patriot Freeway north to Fort Bliss and outer reaches of El Paso. Photo taken 01/14/06. Two lanes part ways with Interstate 10 east a half mile ahead of the four level interchange with U.S. 54 (Patriot Freeway) and Interstate 110. The two routes travel side by side toward U.S. 62 (Paisano Drive). Photo taken 01/14/06. Presently traffic partitions between a two lane flyover for U.S. 54 (Patriot Freeway) east toward Fort Bliss and Alamogordo, New Mexico and a single lane ramp onto unsigned Interstate 110 south. Photo taken 01/14/06. Guide signs along IH 10 west omit IH 110, referencing Juarez, Mexico instead. The freeway merges with U.S. 180 just east of the IH 110 north end. Photo taken 04/25/17. Interstate 10 travels below grade with eight overall lanes from Reynolds Street west to the four-level interchange with IH 110 south and U.S. 54 (Patriot Freeway) east. Photo taken 04/25/17. Two lanes depart from IH 10 & U.S. 180 west for U.S. 54 (Patriot Freeway) north to Fort Bliss and Interstate 110 south to Juarez, Mexico. There is no access to U.S. 54 west from IH 10 presently, but proposed changes with the I-10 Connect Project will add that missing movement. Photo taken 04/25/17. Traffic partitions along the flyover from Exit 22B for U.S. 54 (Patriot Freeway) east to Alamogordo, New Mexico and IH 110 south to U.S. 62 (Paisano Drive) and the Bridge of the Americas into Mexico. Photo taken 04/25/17. Flyovers from IH 10 & U.S. 180 east and west combine along side U.S. 54 (Patriot Freeway) south. Two lanes continue directly to the three-level interchange with U.S. 62 and the Cordova Port of Entry from IH 110 south. Photo taken 04/25/17. Interstate 110 partitions with U.S. 54 (Patriot Freeway) at a wye interchange. Ramps simultaneously join IH 110 south from U.S. 54 west and depart from IH 110 south to U.S. 62 (Paisano Drive). Photo taken 04/25/17. Flyover ramps from IH 10 east and west combine to form the southbound roadway of IH 110 adjacent to the U.S. 54 (Patriot Freeway) mainline. Both freeways travel south over SH 20 (Alameda Avenue) to a wye interchange (Exit 20B). Photo taken by Jake Bear and Kevin Trinkle (08/07/10). A two-lane ramp (Exit 20B) departs from U.S. 54 (Patriot Freeway) westbound to adjacent Interstate 110 as the freeway curves west to U.S. 62 and the port of entry into Juarez, Mexico. Photo taken by Jake Bear and Kevin Trinkle (08/07/10). Button copy signs posted on the U.S. 54 (Patriot Freeway) westbound viaduct one half mile ahead of what was Exit 0B to unsigned I-110. Photo taken 01/14/06. Signs for Interstate 110 only referenced Juarez, Mexico prior to 2010. U.S. 54 ends in three quarters of a mile at Texas Loop 375 (Cesar Chavez Highway). Photo taken 01/14/06. Two lanes of IH 110 emerge from below the three level diamond interchange with U.S. 62 (Paisano Drive) ahead of the Cordova International Bridge over the Rio Grande. Photo taken by Robert Lee (06/06). Entering the Bridge of the Americas Port of Entry at the south end of IH 110. 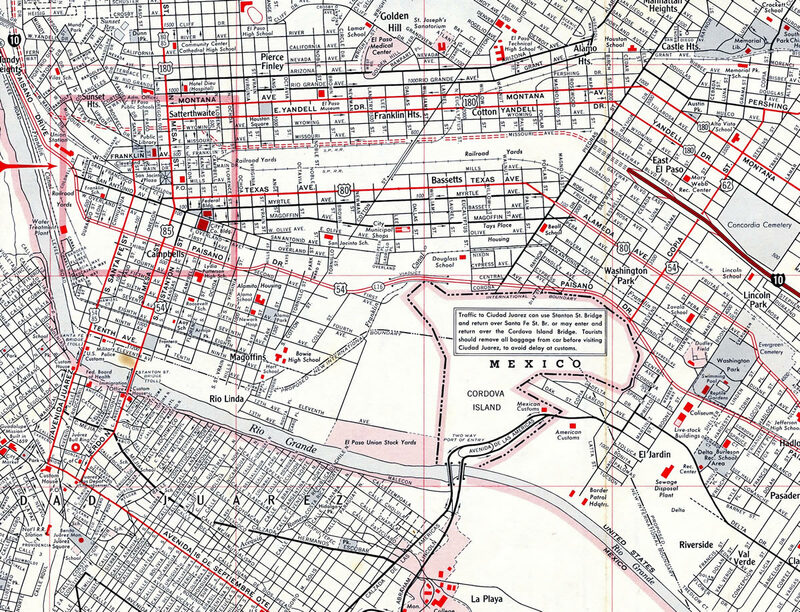 With the exception of the final U-turn to the left, all traffic defaults into Ciudad Juarez, Mexico. Photo taken by Robert Lee (06/06). Guide signs over the ramp from IH 110 south to U.S. 62 (Paisano Drive) previously referenced the connection from U.S. 62 to U.S. 54 west for Loop 375 (Cesar Chavez Border Highway) Photo taken by Kevin Trinkle (02/27/05). Guide signs installed beyond the customs station in 2010 acknowledged IH 110. Traffic exiting the border station from the left defaults onto the freeway north to IH 10, while the right exit includes access to U.S. 62 (Paisano Drive). Photo taken 04/25/17. 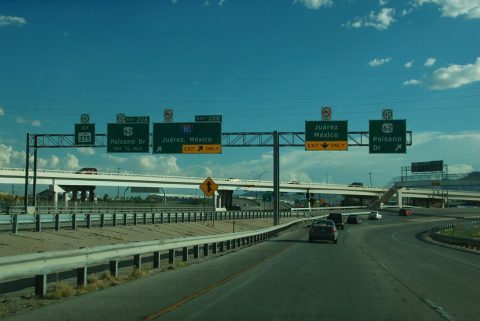 A three-level interchange joins IH 110 with U.S. 62 (Paisano Drive) west to Downtown El Paso and east to U.S. 54 (Patriot Freeway), the El Paso Zoo and the El Paso County Coliseum. Photo taken 04/25/17. Service roads connect ramps between IH 110 and U.S. 62 (Paisano Drive) at signalized intersections. Chamizal National Memorial lies southwest of the exchange. Photo taken 04/25/17. The zero milepost for IH 110 stands just beyond the Bridge of the Americas Port of Entry. Photo taken by Robert Lee (06/06). Button copy signs at the northbound beginning of IH 110 previously referenced only the connections with IH 10 and U.S. 54 and 180. Photo taken by Kevin Trinkle (07/31/06). Button copy signs at the ramp split from U.S. 62 (Paisano Drive) to IH 110 north and San Antonio Street. Photo taken 01/14/06. U.S. 62 (Paisano Drive) presently meets Interstate 110 at a volleyball interchange just north of the Bridge of the Americas Port of Entry. The full access exchange provides connections with IH 110 north to U.S. 54 (Patriot Freeway) and IH 10, and the border crossing south to Federal Highway 45 and Ciudad Juarez. The I-10 Connect project will eliminate this interchange. Photo taken 01/14/06. U.S. 62 originates along side U.S. 85 at the border crossing along El Paso Street south of Downtown El Paso. Paisano Drive leads the US highway east along a four lane arterial to Chamizal National Memorial and back to back interchanges with IH 110 and U.S. 54. Photo taken 01/14/06. “Will I-110 (TX) go un-signed once again?” online posting by mwb1848, AARoads Forum, August 25, 2016. Page updated February 1, 2018.